This came out from Thestar yesterday. Alternatively, one can also read from below. Come to think of it, it may not be far off from what I have been prophesying. I may not be from the airline industry, however if we do look at the trend of several of other industries that have gone really global, it is definitely coming. Of course, there are some who says that I should not be taking examples from Europe and bring them here as it if it is going to happen the same. It may not be entirely the same but in fact things may happen even faster, whether the government of each countries like it or not. 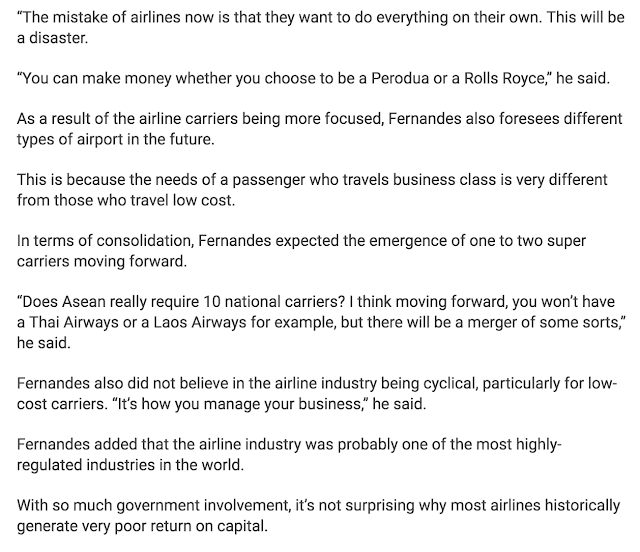 In the end of my article, I had a bold statement where I said, I believe Airasia will one day be a $10 billion company - in 10 to 20 years time. 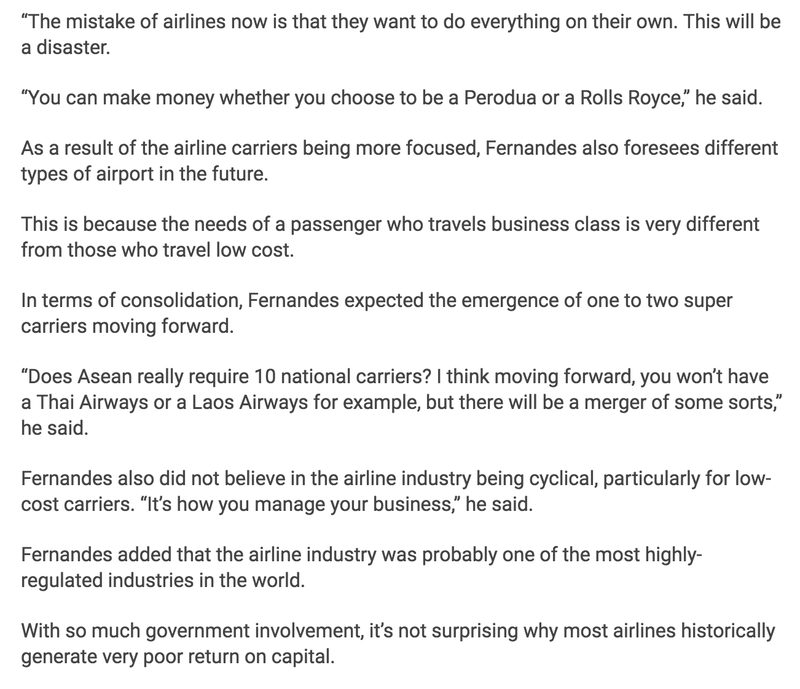 It is not arrogance or crazy but already in the works of the Airasia group if you between the lines what they are trying to do. They are trying to consolidate the entire group and hence make the company as 1 single company for transaction. By doing that, Airasia is no longer a Malaysian or Thai company. Of course he is trying to say it is an ASEAN company, but I think it is even bigger looking at the moves that it has gone to Japan and India. Airasia is even talking to partner in China. 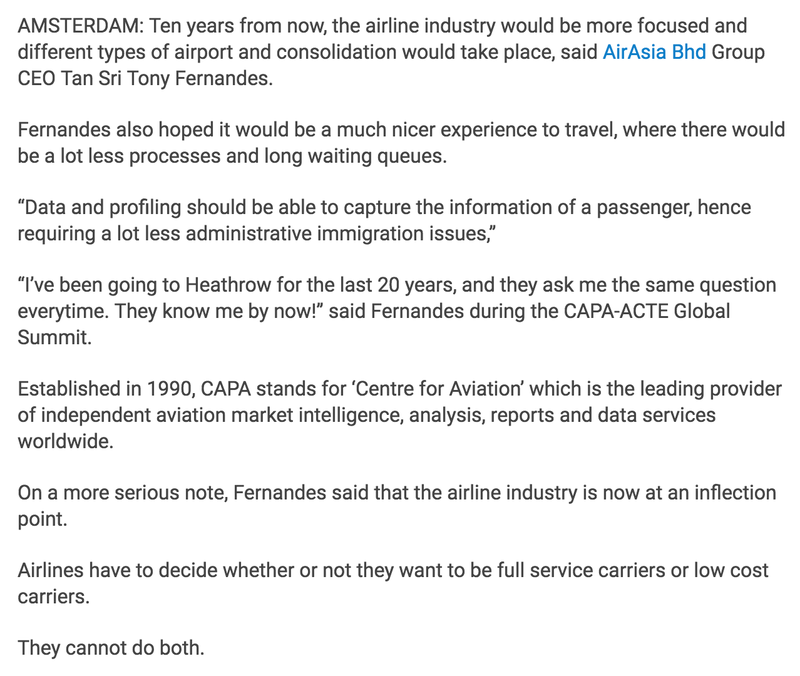 In fact, the airline industry in Asia is slow to change and adapt. Still every country is trying to defend. There will be consolidation and merger will happen. 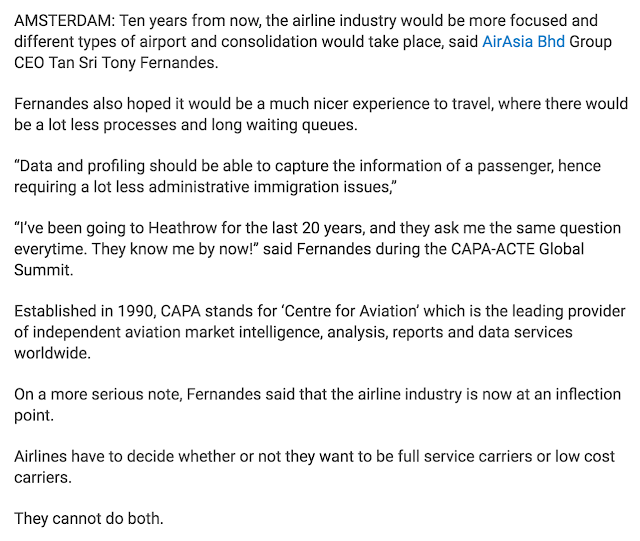 The smaller airline will not be able to survive as they are just too small. What is your view on Cyrus Mistry's allegation about AirAsia India? This has received little coverage from local media. I don't know but Ratan Tata seems to support airlines business. I think it is positive and there is still opportunity to grow in India.